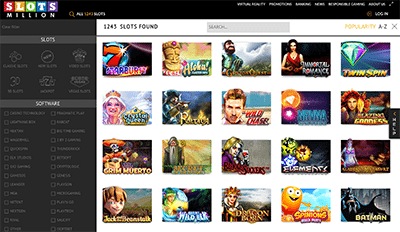 Slots Million is a relatively young online casino, only emerging onto the online gambling scene in 2014. During that time, the venue has already managed to establish itself as one of the go-to safe casino sites for real money and free play games, providing one of the largest game catalogues you will find anywhere on the Internet. Up until 2017, Slots Million was a space designed exclusively for online slot games, but all that changed when the venue added close to 300 other casino games, including a large selection of video poker, table games and niche games, making Slots Million a comprehensive platform for all your favourite online casino games, even if the slots aren’t your cup of tea. All games at Slots Million are powered using Flash or HTML5 software, making them compatible with all modern computers and data-enabled mobile devices. No downloads are required to access any of the games, with games available for instant-play directly over your Web browser. 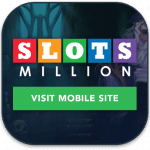 Slots Million is compatible with PC, Mac, iPad, iPhone, Samsung, Windows Phone and other mobile devices operating off the Android platform. No app is required for portable play, simply tap our links to play directly from your computer, smartphone or tablet from anywhere you can secure a strong Internet connection. We’re a big fan of the no frills, no fuss welcome bonus that Slots Million offers to new players. While it may not be the biggest sign-up incentive out there (for comparison, casino sites like All Slots Casino offer up to $1600 in welcome bonuses), it’s a straight-up bonus without the complexities of too many confusing terms and conditions. New player sign-up bonus: New players at Slots Million are eligible for a welcome bonus of up to $100 when signing up for an account and making their first real money deposit, along with 100 free spins to use on popular NetEnt slot games, Gonzo’s Quest, Twin Spin, Jack and the Beanstalk, Spinata Grande and Fruit Shop. You need to make a minimum deposit of $20 to claim the bonus, and the free spins will be credited to your account in instalments of 20 during your first five days of membership. All bonus money and free spins are subject to a wagering requirement of 35X before winnings can be withdrawn. Ongoing promotions: The rewards keep on coming once your welcome bonus has been exhausted, with Slots Million offering all kinds of ongoing promotions to keep regular players interested. From a 50% bonus for Friday Happy Hour, to free spins during your lunchbreak, to Ladies Night and Gentlemen’s Night, there’s always a reason to keep coming back to Slots Million. Head to the website and click on the ‘Promotions’ tab at the top of the screen for full details about the promos and bonuses on offer to players from your country. Note: Slots Million’s welcome bonus is only available to players from Australia, New Zealand, Finland, Sweden, Austria, South Africa, Ireland, Iceland, Luxemburg, Switzerland, Germany and Aland Island. Above all else, SlotsMillion.com is known for its epic collection of online slot games, totally over 1,800 at the time of writing and ever-growing. Slots Million is dedicated to offering new games every week, so you never have to wait long before a new title is unleashed, making this the number one online casino for slot machine enthusiasts. If there’s a slot game you’re looking for, chances are you will find it here. And many more. With all slot games available with no-downloads and for free play in practice mode, players are free to sample as many games as your heart desires before ever committing to play for real money. Games are fast to load and play smoothly provided you are playing on a reliable Internet connection. Like the slots selection, all casino games are available for free play in practice mode, so you can learn new game rules, try unique variants and hone your skills before committing to play for real cash. The casino game selection at Slots Million is already one of the most comprehensive of all our recommended online casinos, so this site definitely gets our two thumbs up for punters seeking a casino site that has it all. Yep you heard that right, Slots Million is also the first ever online casino to offer virtual reality gaming. With the help of the state-of-the-art Oculus Rift wearable headset, players can now walk into the virtual halls of a sophisticated gaming lounge located high in the city skyscape of a virtual casino building. 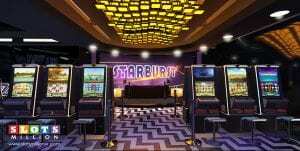 You get to choose an avatar, stroll around and interact with other players, have a virtual drink at the swanky cocktail bar, and then sit at your chosen slot machine to play the game in full VR. For players who don’t have access to an Oculus Rift headset, you can play games in 3D instead. A software download is available to access to virtual reality casino, but this can be downloaded for free at Slots Million VR Casino. All deposits are processed instantly, except payments via wire transfer which can take three to five business days to clear. Note: the payment options available to you will depend on the country you are playing from, as not all payment methods are available to all players due to region restrictions. Is Slots Million safe and regulated? Absolutely. Not only does Slots Million offer an all-inclusive, vibrant place to play the biggest selection of online slots and table games on the Web, it is also fully licensed, regulated and protected by stringent digital security measures. Slots Million has its gaming licensed from the Malta Gaming Authority (MGA) and Curacao eGaming, two of the most reliable names in online gambling jurisdictions. All games and software is tested and audited by iTech Labs, BMM Test Labs, GLI and TST, and the site is secured by Norton Secured and McAfee Secure, with all payments and personal information protected by 128 Bit SSL digital encryption security. For players who require assistance, help and general customer service is available via email, phone and live chat. Visit Slots Million today to sign up for an account, make a real money deposit and claim up to $100 in bonus money plus 100 free spins to use on some of the hottest slot games on the web.